By depressing the freezing point of water, calcium chloride is used to prevent ice formation and is used to de-ice. This application consumes the greatest amount of calcium chloride. Calcium chloride is relatively harmless to plants and soil. As a de-icing agent, it is much more effective at lower temperatures than sodium chloride. When distributed for this use, it usually takes the form of small, white spheres a few millimeters in diameter, called prills. Solutions of calcium chloride can prevent freezing at temperature as low as −52 °C (−62 °F), making it ideal for filling agricultural implement tires as a liquid ballast, aiding traction in cold climates. It is also used in domestic and industrial chemical air dehumidifiers. Calcium chloride was sprayed on this road to prevent weathering, giving it a wet appearance even in dry weather. The second largest application of calcium chloride exploits hygroscopic properties and the tackiness of its hydrates. A concentrated solution keeps a liquid layer on the surface of dirt roads, which suppresses formation of dust. It keeps the finer dust particles on the road, providing a cushioning layer. If these are allowed to blow away, the large aggregate begins to shift around and the road breaks down. Using calcium chloride reduces the need for grading by as much as 50% and the need for fill-in materials as much as 80%. The average intake of calcium chloride as food additives has been estimated to be 160–345 mg/day. Calcium chloride is permitted as a food additive in the European Union for use as a sequestrant and firming agent with the E number E509. It is considered as generally recognized as safe (GRAS) by the U.S. Food and Drug Administration. Its use in organic crop production is generally prohibited under the US National Organic Program. In marine aquariums, calcium chloride is one way to introduce bioavailable calcium for calcium carbonate-shelled animals such as mollusks and some cnidarians. Calcium hydroxide (kalkwasser mix) or a calcium reactor can also be used. As a firming agent, calcium chloride is used in canned vegetables, in firming soybean curds into tofu and in producing a caviar substitute from vegetable or fruit juices. It is commonly used as an electrolyte in sports drinks and other beverages, including bottled water. The extremely salty taste of calcium chloride is used to flavor pickles without increasing the food's sodium content. Calcium chloride's freezing-point depression properties are used to slow the freezing of the caramel in caramel-filled chocolate bars. Also, it is frequently added to sliced apples to maintain texture. In cheesemaking, calcium chloride is sometimes added to processed (pasteurized/homogenized) milk to restore the natural balance between calcium and protein in casein. It is added before the coagulant. Calcium chloride is used to prevent cork spot and bitter pit on apples by spraying on the tree during the late growing season. Drying tubes are frequently packed with calcium chloride. Kelp is dried with calcium chloride for use in producing sodium carbonate. Anhydrous calcium chloride has been approved by the FDA as a packaging aid to ensure dryness (CPG 7117.02). The hydrated salt can be dried for re-use but will dissolve in its own water of hydration if heated quickly and form a hard amalgamated solid when cooled. Calcium chloride is used in concrete mixes to accelerate the initial setting, but chloride ions lead to corrosion of steel rebar, so it should not be used in reinforced concrete. The anhydrous form of calcium chloride may also be used for this purpose and can provide a measure of the moisture in concrete. 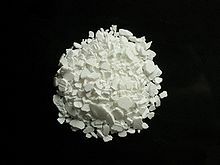 Similarly, CaCl2 is used as a flux and electrolyte in the FFC Cambridge process for titanium production, where it ensures the proper exchange of calcium and oxygen ions between the electrodes. Calcium chloride is also used in the production of activated charcoal. 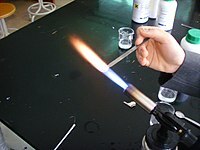 Calcium chloride dihydrate (20% by weight) dissolved in ethanol (95% ABV) has been used as a sterilant for male animals. The solution is injected into the testes of the animal. Within 1 month, necrosis of testicular tissue results in sterilization. Calcium chloride can act as an irritant by desiccating moist skin. Solid calcium chloride dissolves exothermically, and burns can result in the mouth and esophagus if it is ingested. Ingestion of concentrated solutions or solid products may cause gastrointestinal irritation or ulceration. Consumption of calcium chloride can lead to hypercalcemia. Calcium chloride has a very high enthalpy change of solution, indicated by considerable temperature rise accompanying dissolution of the anhydrous salt in water. This property is the basis for its largest-scale application. Structure of the polymeric [Ca(H2O)6]2+ center in crystalline calcium chloride hexahydrate, illustrating the high coordination number typical for calcium complexes. North American consumption in 2002 was 1,529,000 tonnes (3.37 billion pounds). In the US, most of calcium chloride is obtained by purification from brine. A Dow Chemical Company manufacturing facility in Michigan houses about 35% of the total U.S. production capacity for calcium chloride. As with most bulk commodity salt products, trace amounts of other cations from the alkali metals and alkaline earth metals (groups 1 and 2) and other anions from the halogens (group 17) typically occur, but the concentrations are trifling. Calcium chloride occurs as the rare evaporite minerals sinjarite (dihydrate) and antarcticite (hexahydrate). The related minerals chlorocalcite (potassium calcium chloride, KCaCl3) and tachyhydrite (calcium magnesium chloride, CaMg2Cl6·12H2O) are also very rare. ^ "CALCIUM CHLORIDE (ANHYDROUS)". ICSC. International Programme on Chemical Safety and the European Commission. ^ Seidell, Atherton; Linke, William F. (1919). Solubilities of Inorganic and Organic Compounds (2nd ed.). New York: D. Van Nostrand Company. p. 196. ^ a b c d e f Anatolievich, Kiper Ruslan. "Properties of substance: calcium chloride". chemister.ru. Retrieved 7 July 2014. ^ a b c d e f Pradyot, Patnaik (2019). Handbook of Inorganic Chemicals. The McGraw-Hill Companies, Inc. p. 162. ISBN 978-0-07-049439-8. ^ a b c d Müller, Ulrich (2006). Inorganic Structural Chemistry. wiley.com (2nd ed.). England: John Wiley & Sons Ltd. p. 33. ISBN 978-0-470-01864-4. ^ a b c Sigma-Aldrich Co., Calcium chloride. Retrieved on 2014-07-07. ^ "MSDS of Calcium chloride". fishersci.ca. Fisher Scientific. Retrieved 7 July 2014. ^ "Binary Phase diagram: The Calcium Chloride – water system". Aqueous Solutions Aps. October 2016. Retrieved 20 April 2017. ^ "humantouchofchemistry.com Keeping Things Dry". Retrieved 23 October 2014. ^ "Dust: Don't Eat It! Control It!". Road Management & Engineering Journal. US Roads (TranSafety Inc.). 1 June 1998. Retrieved 9 August 2006. ^ Calcium Chloride SIDS Initial Assessment Profile, UNEP Publications, SIAM 15, Boston, 22–25 October 2002, pp. 13–14. ^ "Apple Caviar Technique". StarChefs Studio. StarChefs.com. April 2004. Retrieved 9 August 2006. ^ "CPG 7117.02". FDA Compliance Articles. US Food and Drug Administration. March 1995. Retrieved 3 December 2007. ^ "Accelerating Concrete Set Time". Federal Highway Administration. 1 June 1999. Retrieved 16 January 2007. ^ National Research Council (U.S.). Building Research Institute (1962). Adhesives in Building: Selection and Field Application; Pressure-sensitive Tapes. National Academy of Science-National Research Council. pp. 24–5. ^ Jana, K.; Samanta, P.K. (2011). "Clinical evaluation of non-surgical sterilization of male cats with single intra-testicular injection of calcium chloride". BMC Vet. Res. 7: 39. doi:10.1186/1746-6148-7-39. PMC 3152893. PMID 21774835. ^ "Product Safety Assessment (PSA): Calcium Chloride". Dow Chemical Company. 2 May 2006. ^ "Calcium Chloride Possible Side Affects". ^ Calcium Chloride SIDS Initial Assessment Profile, UNEP Publications, SIAM 15, Boston, 22–25 October 2002, page 11. ^ Calcium Chloride Chemical Profile, The Innovation Group, www.the-innovation-group.com, printed 9 September 2005. Wikimedia Commons has media related to Calcium chloride. Centers for Disease Control and Prevention, National Institutes of Occupational Safety and Health, "Calcium Chloride (anhydrous)"
This page was last edited on 2 April 2019, at 20:22 (UTC).